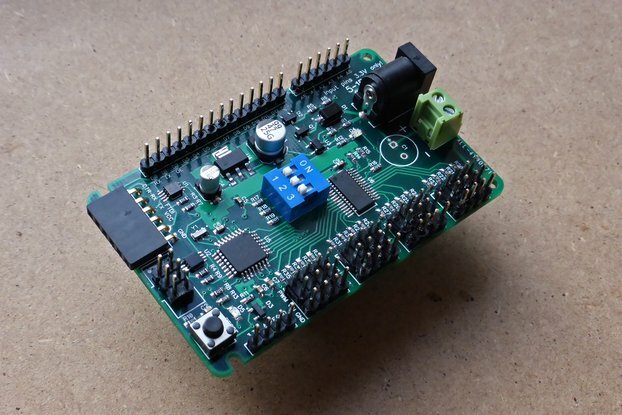 This is a simple development board for the Atmel ATtiny1634. 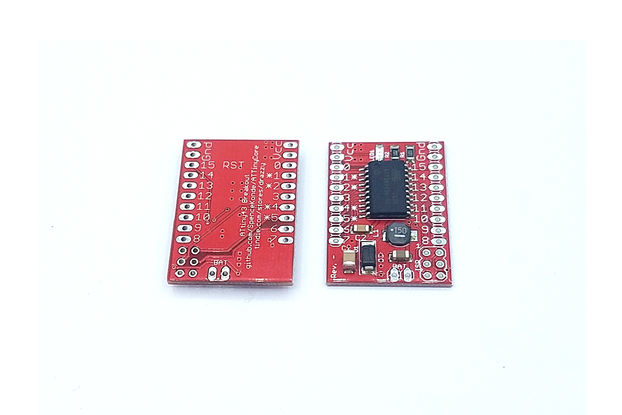 It provides the familiar 6-pin FTDI header for connecting to serial and ISP header for programming via ISP, and it has the capacitor for auto reset. A jumper is can be used to enable or disable auto reset. 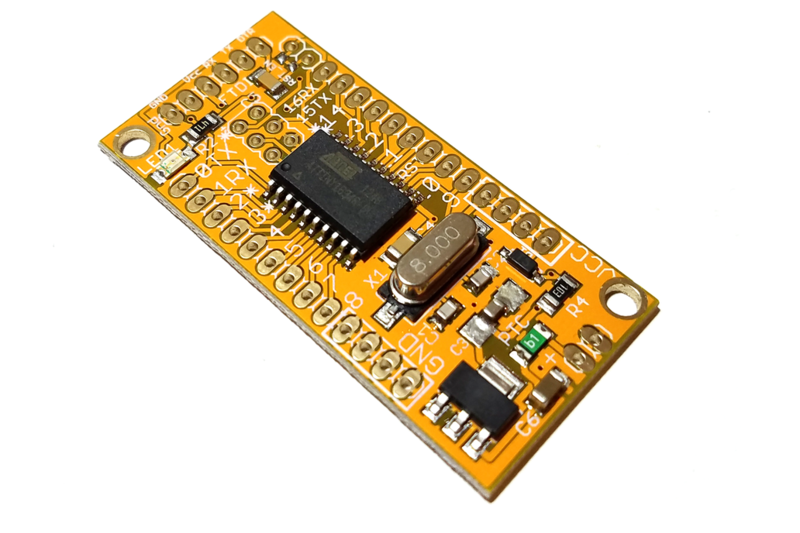 It can be used with breadboard, by mounting the pins pointing down, or as a standalone board for use with female dupont jumpers, with the pins pointing up. For ease of connection w/out breadboard, four Vcc and Gnd pins are provided, instead of just one. An LDO regulator is provided for use with an external power source, or it can be powered direct from Vcc and Gnd pins. Available with and without a crystal. This board is sold ASSEMBLED, but WITHOUT PIN HEADER (as shown). 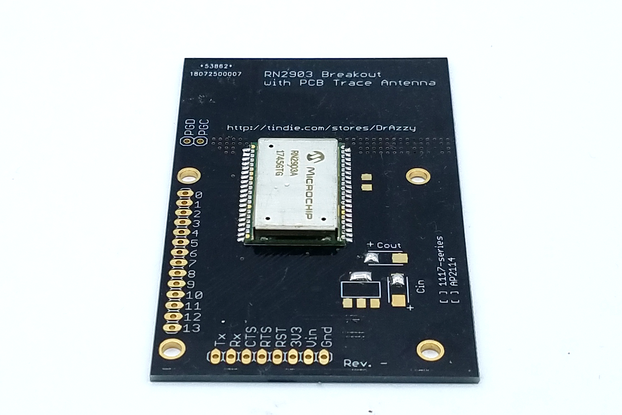 What sets this apart from a typical ATtiny1634 breakout board (other than the fact that they don't seem to exist) or generic SOIC-20 breakout board is that it provides the appropriate header for serial programming of an ATtiny1634, and the chip comes pre-programmed with the Optiboot bootloader, so programming it with the Arduino IDE is as simple as using an Arduino Pro Mini (You can always erase the bootloader by programming via the ISP header if you need the space and/or wish to program using Atmel Studio instead of Arduino). 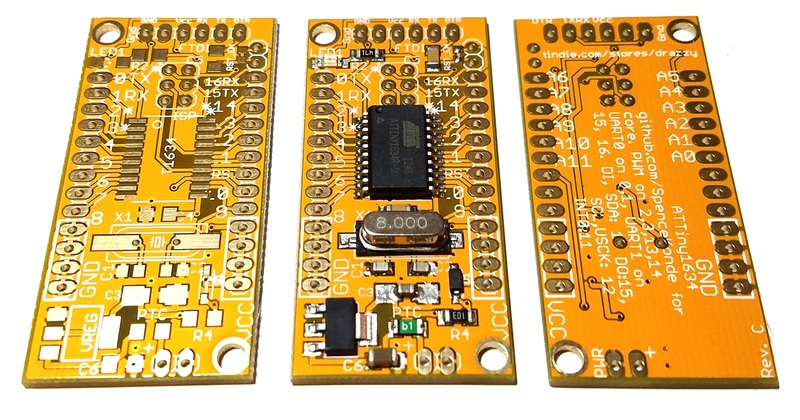 We are proud to announce a new and improved version of this popular board, with a few exciting features - except where noted in option menu, all assembled ATTiny1634 boards use the new Rev. C design. The Atmel ATtiny1634 microcontroller is an exciting and economical processor from Atmel's ATtiny line of 8-bit AVR microcontrollers. 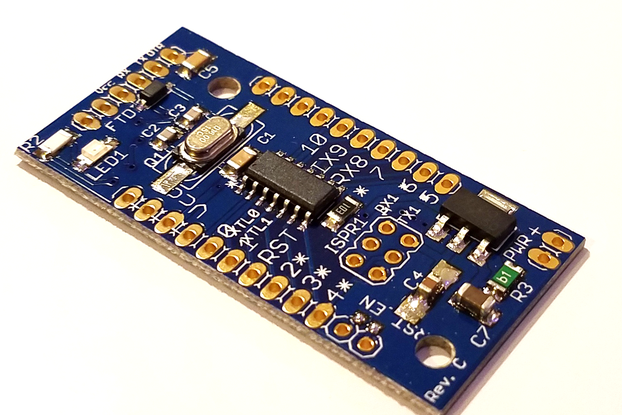 Although it doesn't have a third timer like the tiny841 does, the combination of large flash and SRAM memory, dual uarts, and 17 GPIO pins makes it a compelling package, filling a space between the smaller Tiny's, and the ever popular '328p. 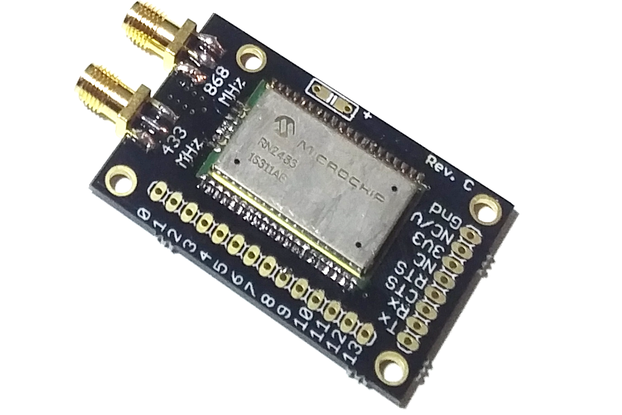 The second uart makes this chip particularly well suited for use with GPS, GSM, and serial WiFi adapters (like the ESP8266) without interfering with serial programming. For all boards without a crystal, the 1634R will be used - this differs only in that the internal oscillator is more tightly calibrated. A CH340G-based serial adapter is available as an option. This will be supplied with a 6-pin cable as shown. 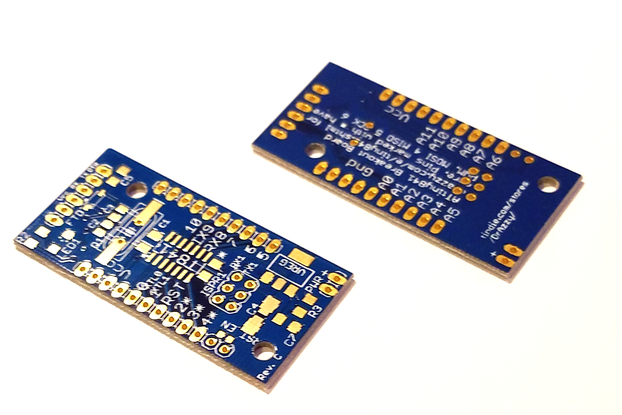 These are mass production adapters, however they are a cut above the most common units, and have a switch to select 3.3v or 5v operation. 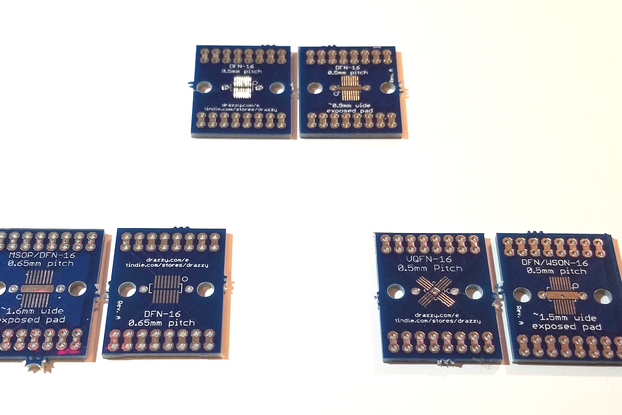 They break out the pins necessary for programming one of these breakout boards, or an Arduino Pro Mini or similar - Vcc, Gnd, TX, RX, DTR and CTS. 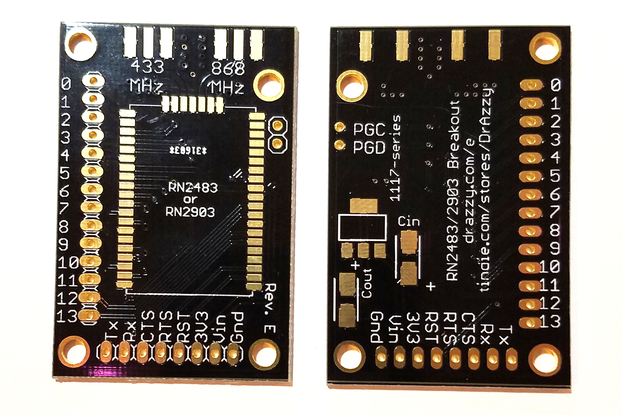 For a fancier CH340G adapter which breaks out all pins, check out my own CH340G-based design. Custom options are available for regulator and crystal - specify in order comments what regulator voltage and crystal you want. Note that at voltages above 4-4.5V, the internal oscillator runs too fast for UART communication (fig 26-64 on pg 274 of the datasheet), so the bootloader will not work and this configuration is not recommended. If you want a chip set to use the internal oscillator, and >3.3v regulator, please acknowledge that you are aware of this issue in the order comments (else I will contact you to confirm, which could delay your order). Available custom speeds are internal 1mhz or 8mhz, or external 7.3728, 8, 9.216, 11.0592, 12, 13.56, 14.318, 14.745 and 16 MHz and operating voltages of 1.8, 2.5, or 3.3v or 5v. Please refer to fig 24-1 on pg 230 of the datasheet for max rated clock speed at a given voltage - if you are requesting a crystal which is faster than the manufacturer spec for the regulator output voltage, please acknowledge in order comments that you know that you're asking for a board that is outside manufacturer spec (otherwise I will contact to confirm, delaying your order). Please allow 1-3 days extra processing time for custom order. Used this board to check software I had written for a system including an SD card and UART, using avr-gcc. Everything worked fine, just as the really-tiny ATtiny1634 package on my final circuit board. A schematic would have been appreciated, but I managed in any case. The 20pin SOIC was large enough to probe, not like the 4mm square package of the actual production chip we used. 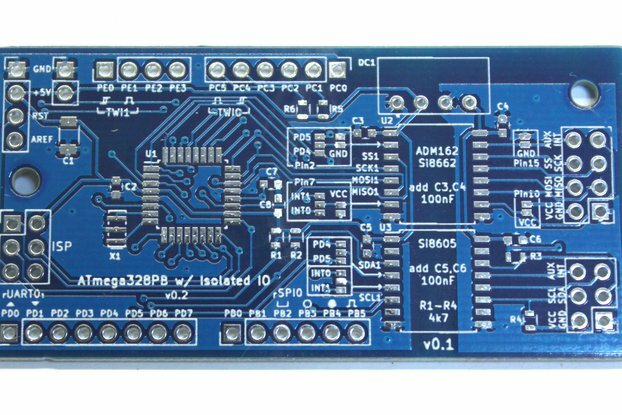 Excellent product, with a well-thought-out 6pin SPI connector and voltage regulator. It gets easier, which is better. 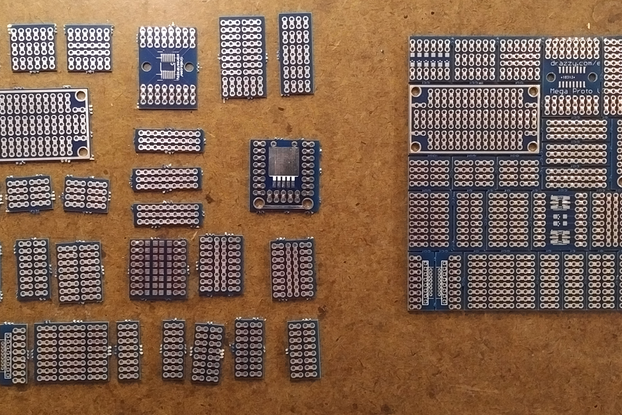 I was excited when I got DrAzzy's 1634 (bare) board -- I set out to build one to hone some surface-mounting skills The result was a working unit! I used the (on advice) cheapest parts I could find. (I built 4, with 1 failure). 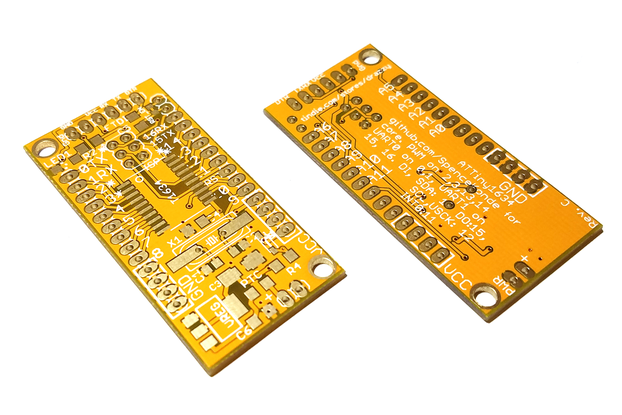 My advice: If you want to learn to surface mount solder -- get the bare board -- spacing is nice and forgiving -- if you want to "get on with it" and program and use the board, get his optiboot versions. Either way, you won't be sorry you did.